Summary: When Peter’s father goes to war, Peter is sent to live with his grandfather. His father says that Peter’s pet fox, Pax, must be returned to the wild. We see this happening from Pax’s point of view, and the story of what happens after that is told in chapters that alternate between Peter’s and Pax’s stories. Peter realizes he has done a terrible thing, and runs away to try to rescue Pax. A few days out, he breaks a bone in his foot, and is taken in by Vona, a woman whose own war experiences left her so scarred, both physically and emotionally, that she has withdrawn from the human race. Meanwhile, Pax meets up with some foxes in the woods, and slowly, still desperately hoping for Peter’s return, starts to make a life for himself in the wild. While Peter and Pax are on their journeys, the war is slowly encroaching into both of their lives, leading up to a climactic finale. 288 pages; ages 8-12. Pros: This beautifully written and illustrated story will undoubtedly be a 2016 awards contender. 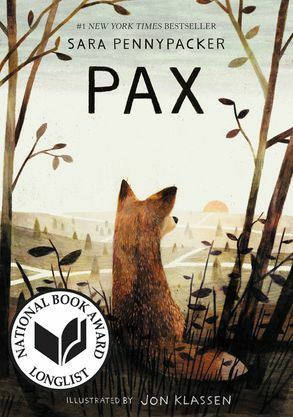 Filled with love, hope, friendship, and healing, Pax is a book to savor and discuss. Cons: This sometimes felt a bit too much like a Book With A Message (see somewhat self-congratulatory book trailer). A little infusion of humor wouldn’t have made the story any less powerful. I would love to read this and maybe even read it aloud to my students. Yes, it would be a great read-aloud; you could have a lot of interesting discussions throughout. Love your reviews! I will order this from the library, of course!